04/03/2019 Third Saturday is April, 20th with Alder Street. 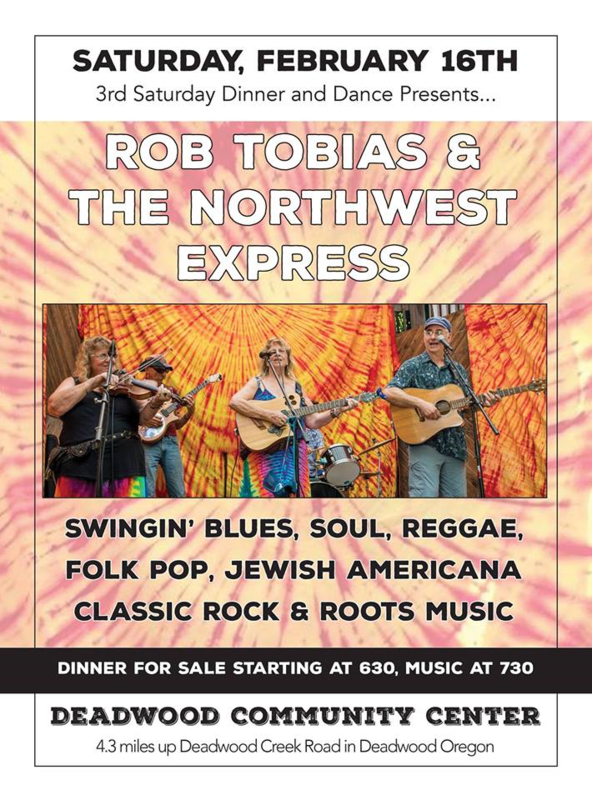 02/05/2019 Third Saturday is February 16th with Rob Tobias and The Northwest Express. 01/06/2019 Third Saturday is January 19th featuring The Kush Band. 12/02/2018 Third Saturday is 12/15/18 featuring Joy Economy and Friends. 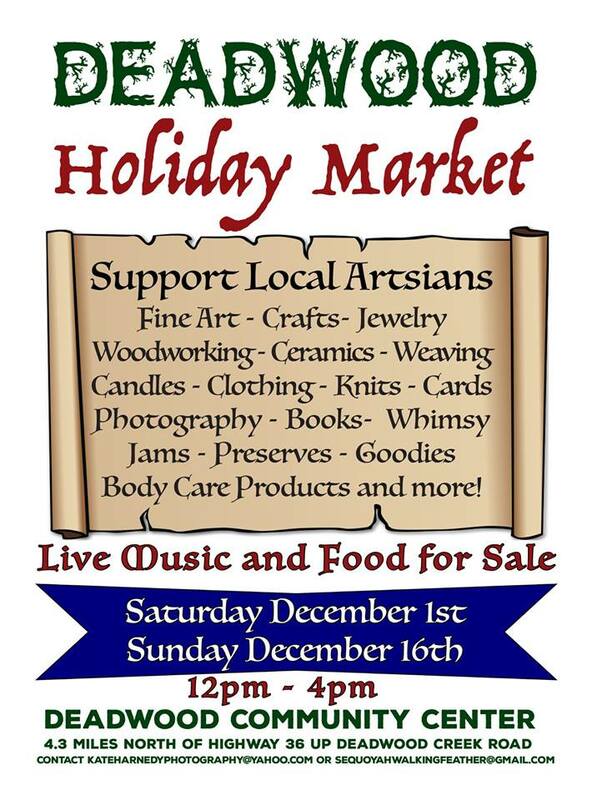 11/29/2018 This Saturday come visit local artists at the community center's Holiday Market. 11/1/2018 Third Saturday is 11/17/2018 with Skip Jones. See Ditto for details. 09/12/2018 Third Saturday this weekend 9/15/2018 with Bob Santori Trio. Visit Music in Deadwood page. Don't miss the special ceremony this Third Saturday. 07/03/2018 The Deadwood Ditto is now posted for your enjoyment. 06/14/2018 Third Saturday is this weekend 6/16/2018. Groovy Danceable Jams & Psychedelic Rock with the Token Rhymes. 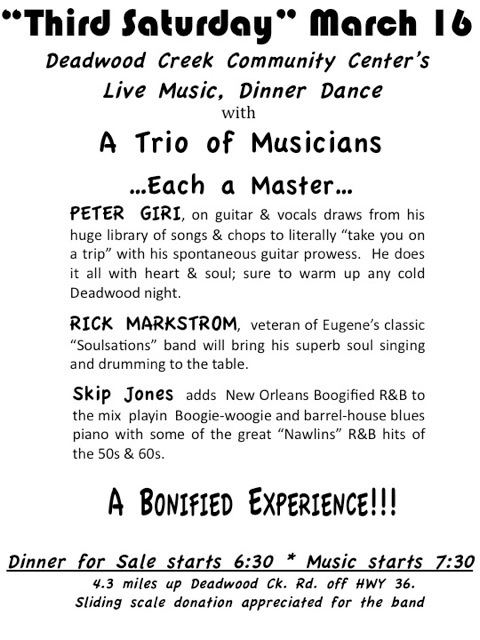 5/19/2018 3rd Saturday Dinner and Dance in Deadwood, featuring the Michael Anderson Trio! Dinner for sale starting at 6:30, music at 7:30. This month we welcome back... The Michael Anderson Trio! Michael has bee a mainstay on the Eugene music scene in various guises for 30-plus years. He’s traveled internationally backing artists, as well as playing styles of music from Country to Rock to Jazz, Folk, and Rhythm and Blues. He's also spent some time working with the great drummer Donny Osbourne (Mel Torme), as well as Paul Cotton, from the famous band POCO. He’s worked in video and radio production and as a session musician on numerous albums by local artists. 4/28/2018 May Day Run and Annual Plant Sale is May 6th. 4/6/2018 Traveling Exhibit on Japanese Internment will be held at the Deadwood Community Center on April 14th from 11am to 5 pm. See Ditto for more info. 1/2/2018 Third Saturday - The Beat Crunchers. See Music in Deadwood page. 12/15/2017 Menu for Third Saturday, December 16. Dinner for sale starting at 6:30. Dinner: PIZZA - options: * gluten free * vegan * vege * meat * also...MINESTSRONE SOUP, SALAD, DESSERT. Music at 7:30. Come out to the Deadwood Community Center for 3rd Saturday Dinner and Dance. This month we welcome a new band to Deadwood - Takatu Boostep! 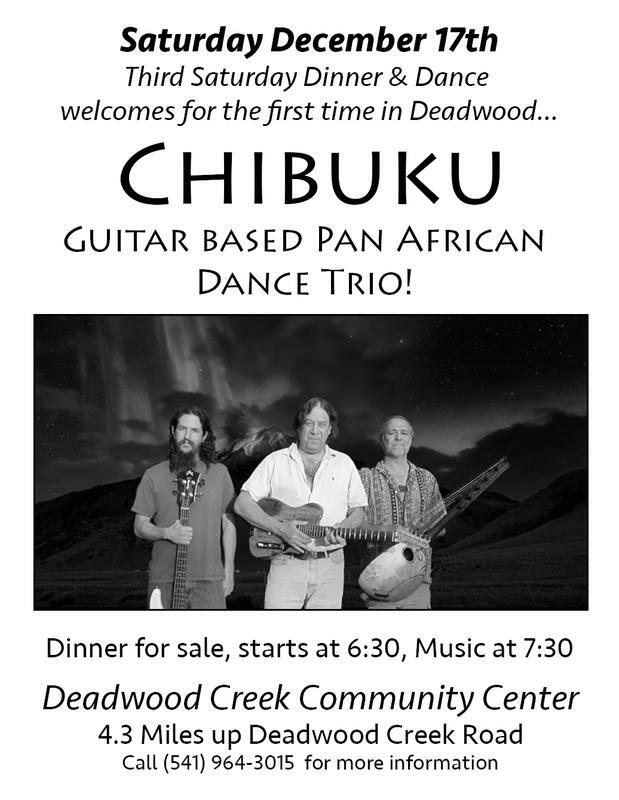 A new project featuring musicians who have played Deadwood with The Beatcrunchers, Chibiku, and the Deb Cleveland Band. Bring your dancing shoes! Takatu Boostep brings us 80's inspired funk and jazz... from another planet! Inspired by Chaka Khan, David Bowie, Thelonious Monk, John Prine, Weather Report, Stevie Wonder, and Return To Forever. 11/30/2017 Third Saturday Dinner and Dance 12/16/17 featuring the r&b, soul, jazz, funk stylings of Takatu Boostep. 11/16/2017 Third Saturday, Nov. 18, 2017 MENU prepared with love and great cooking skills by our soup queen Michelle! Dinner for sale starting at 6:30pm * $7.00 * Menu - Venison Stew, Vegan Vegetable Stew, Vegan, gluten-free Polenta, Beets, Cole Slaw, Very NOT gluten-free homemade bread and butter, DESSERTS. 11/9/2017 DEADWOOD ARTISTS' HOLIDAY BAZAAR. Sunday December 3, 11.am-3pm at Deadwood Community Center, Unique hand made gifts, Great food bar, Support local economy. Call MaryGold 541 964 5341 for more info. 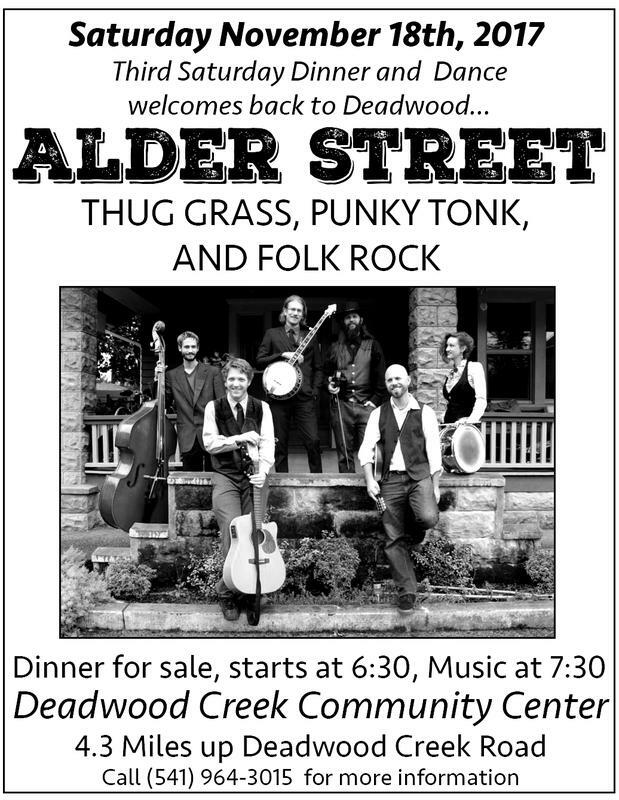 11/9/2017 Come out to the Deadwood Community Center for 3rd Saturday Dinner and Dance featuring Alder Street! Dinner for sale starting at 6:30, music at 7:30. See Music in Deadwood page for more information. 10/19/17 Come out to 3rd Saturday Dinner and Dance featuring Satori Bob! Dinner for sale starting at 6:30, music at 7:30! GREENS WITH GARLIC, as MaryGold experienced in Hong Kong years ago. 10/02/2017 Third Saturday is October 21st featuring Satori Bob. See the Deadwood Ditto or the Music in Deadwood page for more info. Vegetarian and meat options available! 09/06/2017 Third Saturday is back with Steel Wool. 09/16/2017. See the Deadwood Ditto (page 4) for more details. 06/12/2017 Third Saturday with The KUSH Band June 17th. 05/15/2017 Third Saturday is the 20th with Joanne Broh. See her info on Music in Deadwood page. 05/06/2017 Hey folks, need some plant starts for your garden? Tomorrow at 10am is the fun run/plant swap at the Deadwood Community Center, mm 4.3 on Deadwood Creek Road. Come get tomatoes, peppers, broccoli, cabbage, perennials, berries and much more! Also, free pancakes! 03/28/2017 April Third Saturday will be 4/15 (tax day) with the Vipers. How ironic is that? 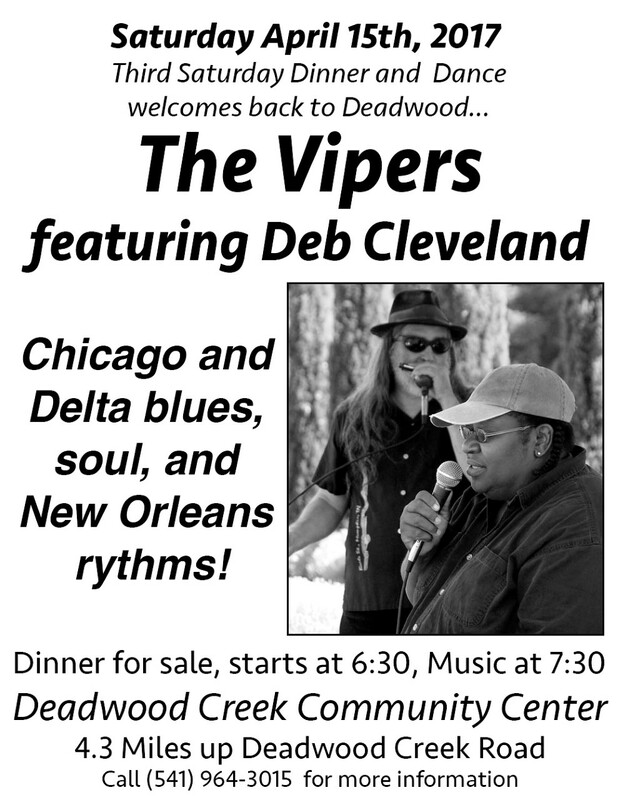 Combine the powerful vocals of gospel-trained Deb Cleveland with the no-nonsense, straight-up blues of four veteran Eugene musicians and you’ve got The Vipers featuring Deb Cleveland. The Vipers mix an intoxicating brew of Chicago and Delta blues, soul, and New Orleans rhythms that will bring you onto the dance floor! The Vipers is comprised of Deb Cleveland (vocals) Jon Silvermoon (vocals, harmonica), Johnny “Guitar” Ward (guitar), Russ Whitlach (bass), and Theo Halpert (drums). The band is a past winner of the Eugene Weekly Reader’s poll as Best Local Blues Band and Deb has won twice as Best Local Blues Personality and once as Female Vocalist. She has also won the Rainy Day Blues Society’s Rooster Award for Female Blues Vocalist.Deb Cleveland has been with the band since late 2002 and is featured on the CDTickle My Toes. She toured Europe with the band including an appearance at Sweden’sLinköping Blues and Jazz Festival. Currently the band is working on a new CD with a planned release in late 2017. Originally the band featured the incendiary guitar work of the late Canned Heat guitarist Henry Vestine from the band’s inception in 1992 until Vestine’s untimely death in 1997. From 1997 to 2002 the band featured veteran bluesman Eagle Park Slim, several of whose original songs are on the CD Good Times Live! The Vipers have performed at numerous festivals including The Waterfront Blues Festival, the Eugene Celebration, the Salem Art Fair and Festival, the Willamette Valley Folk Festival, the Oregon Country Fair, and Sweden’s Linköping Jazz and Blues Festival. Their European tours have taken them to Denmark, Sweden, Norway, Germany, Belgium, and The Netherlands. 03/26/2017 Go Fund Me for the Deadwood Community Center. Click link or read more on the message board page. 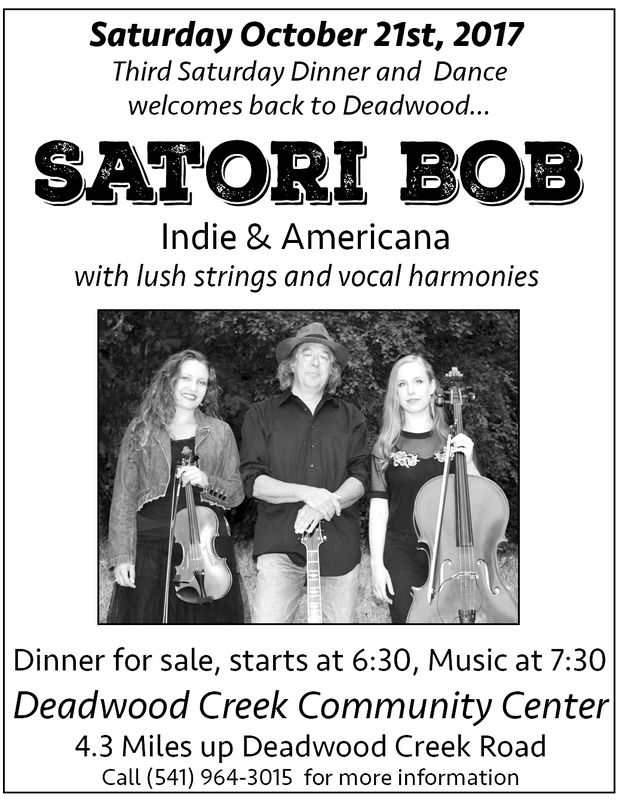 03/01/2017 This month we welcome Satori Bob back to Deadwood for Third Saturday. Based in Eugene, Oregon, Satori Bob is comprised of complex lyrical stories, countless live gigs, and a commitment to space and interaction within the music. Often categorized as Americana, Satori Bob is what happens when Tom Waits meets John Prine at Leonard Cohen’s house for a drink. "Satori Bob is many things, and most recently it is the Satori Bob Large Band. Strong and smooth, professional and energetic, the Large Band is turning heads in the Pacific Northwest and beyond. The band is well suited for large festival stages and house concerts, clubs and special events. We are classified by radio folks as alt-Americana, but we have a unique voice that blends energetic bluegrass styles and gypsy-ish tones and time signatures, open stark ballads and gorgeous instrumental interplay, all serving as the foundation for well-written strongly lyrical compositions. Audiences LISTEN to us, and dance to us. Satori Bob sounds familiar, and yet has a strong voice that's all its own! Our new EP, Stories Left Untold, is finished and now we are preparing to slowly release our tunes into the world." 12/31/2016 Third Saturday with Beat Chunchers on 01/21/2017. See more on Music in Deadwood Page. 11/30/2016 The Annual Holiday Bazaar is this Saturday December 3rd at the Community Center. 11/10/2016 The Third Saturday Event will be on FRIDAY 11/18/2016 with Heavy Chevy. 10/28/2016 Meeting 11/03/2016 Standing Rock. We journeyed from Deadwood to stand in solidarity with the Standing Rock Lakota Sioux tribe as they protect their sacred lands and waters. 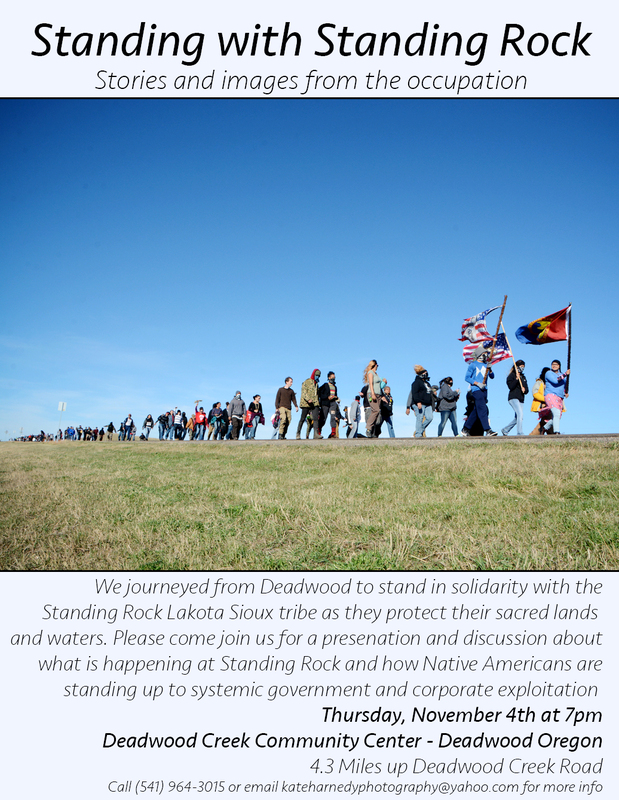 Please come join us for a presentation and discussion about what is happening at Standing Rock. Over 300 indigenous tribes and non-indigenous tribes are standing up in solidarity and saying "NO MORE" to systemic government and corporate exploitation of native peoples. Information, pictures, and video will be presented, along with an open forum for questions and discussion. 10/24/2016 The Annual DCS Meeting is November 13. See the October Ditto for more info. 09/22/16 October Third Saturday will be 10/15/16 with Gumbo Groove. "Gumbo Groove’s music is an adventure in genre bending. We call it Folk-Fueled Fungrass, played on traditional acoustic instruments. Snatches of David Grisman-like riffs give way to New Orleans second line simmers, while shades of the Grateful Dead can be heard wending amongst the chordal carousings. Always friendly, always fun, Gumbo Groove is a musical incident looking for a place to happen." 09/17/2016 Third Saturday - Food, Music, Dance. 4pm  Dramatic readings from  "Quilters",  a play about the lives pioneer women Traditional American musical accompaniment by Eric Sprado and Johnny Schiller 5pm Country Potluck Supper 6:30 Square Dancing. 06/14/2016 Third Saturday with The T Club. 2.) Change the bylaws so that the accounting is a hired position rather than a board position to maintain continuity in the bookkeeping. We welcome your thoughts and input on these or other possibilities for a solution to this situation. This also leaves the Board short one member, therefore we are requesting nominations or volunteers for this position. Hope to hear from you, Sincerely, Carina R., Convener, DCS Board. 05/09/2016 Third Saturday is May 21st featuring Peter Giri and Friends. Southern Rock, Blues, and Country Style Guitar. 04/30/2016 Annual May Day Run and pancake breakfast Sunday May 1, 2016. Evening presentation...see below. 04/25/2016 Paul Meiliara, a Maasai conservation and community leader from Kenya will be giving a presentation and conversation on this Sunday evening at the Deadwood Community Center. The presentation is planned for Sunday May 1st at 7:00 pm. See more info here. 04/04/2016 Third Saturday featuring Beat Root Band. 03/10/2016 Community Fire Meeting this weekend, Sunday March 13 at 5:00 pm. See information in the Ditto. 03/01/2016 Third Saturday March 19th with Satori Bob. Video. 02/04/2016 Third Saturday with The Conjugal Visitors. February 20th. 01/11/2016 Third Saturday with The Kush Band. January 16th. 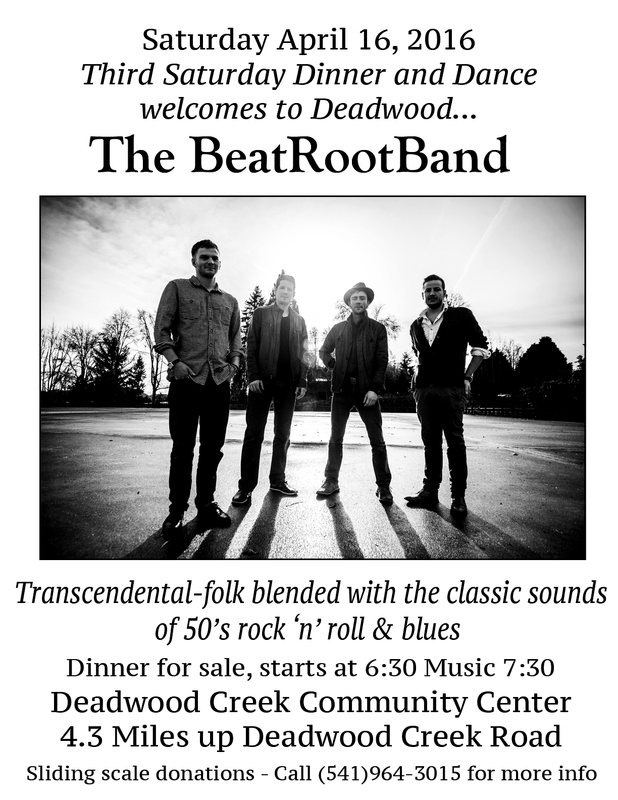 12/08/2015 Come to the beautiful Deadwood Creek Community Center for "Third Saturday" featuring live music, dinner and dance on December 19th. This month we welcome local favorites Steel Wool! 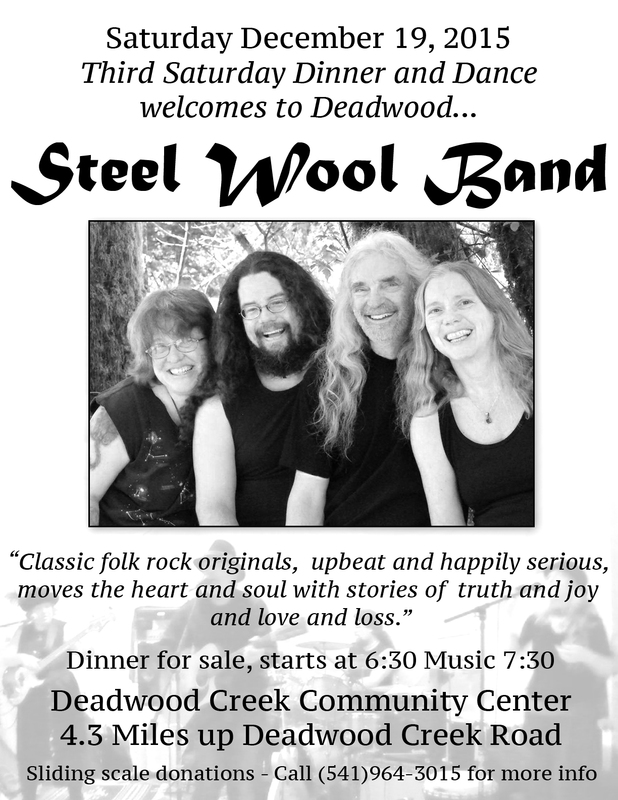 Come to the beautiful Deadwood Creek Community Center for the Winter Solstice 3rd Saturday Dinner and Dance - featuring local favorites STEEL WOOL! “STEEL WOOL takes you on a new journey through real life as they perform original songs in the familiar style of classic folk-rock. Featuring Tim Mueller as songwriter, lead vocalist and guitar player; TR Kelley (Babes with Axes) on bass and vocals, Nel Applegate (Mudzidzi) on mbira, djembe, percussion and vocals, and Randy Hamme (The Raventones) on drums, this Eugene, Oregon band moves the heart and soul with stories of truth and joy and love and loss, and catches fire with three part harmonies, the beautiful mbira, inventive bass lines, danceable grooves and world beat percussion. Doors open for this family friendly event with a gourmet dinner, desserts, and non alcoholic beverages for sale starting at 6:30 and the music starts at 7:30. 12/1/2015 DCS Meeting Annual Meeting minutes 2015. 11/6/2015 Third Saturday - ​Alder Street is boot-stompin’, gritty, and bourbon flavored. Also note the Annual Board Meeting this Sunday 11/8/2015. 10/06/2015 Special Event on 10/11/15. Albina Morilova, Indigenous Itelmen People’s cultural leader from Kamchatka, Russia will be presenting a program of slides and sounds from her homeland. Third Saturday with Skip Jones 10/17/15. 6/4/2015 Third Saturday is June 20th and will feature Joanne Broh Band. 5/13/2015 Third Saturday is May 16th featuring Michael Anderson and Friends Skip Jones and Stan Beacraft. 04/22/2015 A special meeting of DCS and all interested members of the community is happening May 21 at 7 pm at the Community Center. This meeting is to discuss proposed changes to the DCS bylaws, and call a vote of the membership to pass the proposed changes. Here is a copy of the Bylaw changes. We will also be sending out e-mails of the proposed changes. Hope to see you there! 04/20/2015 Third Saturday is May 16th with Michael Anderson & Friends. 04/08/2014 Third Saturday is April 18th featuring Rob Tobias and The Northwest Express. 03/16/2015 Third Saturday is March 21st. See you there. 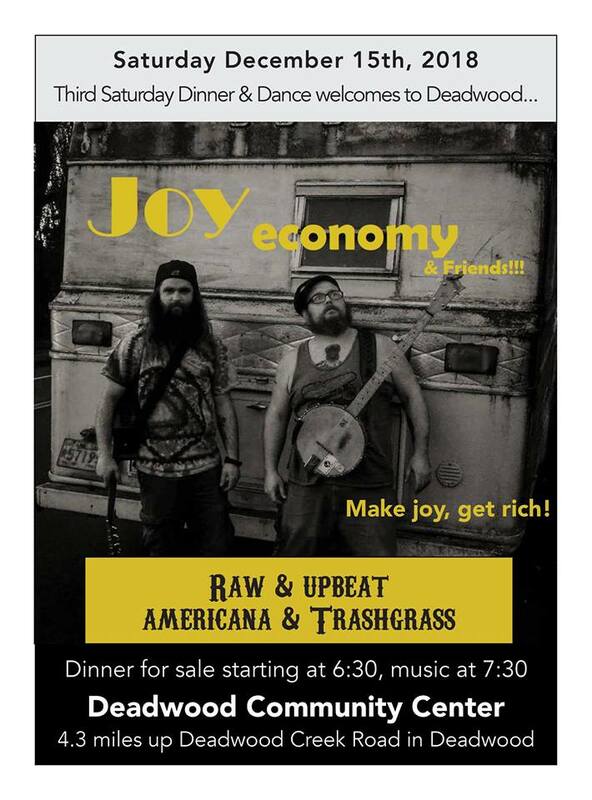 Come celebrate the Spring Equinox with live music, dinner, and dance and listen to some upbeat favorites from some of our local talented musicians, and what a mother load we can claim here in Deadwood/Swisshome area with CLOWN DANCER< featuring Anya, Brian, TR Kelly, and Randy Hamme. They played a great Halloween Party, now we can welcome in the Equinox. Dinner for sale starts at 6:30pm, music starts at 7:30. Sliding scale donations for the band. Beautiful venue and family friendly with a floating wooden dance floor. The Deadwood Creek Community Center is 4.3 miles up Deadwood Creek. Call 541-964-5031 for more info. 03/06/2015 Ariana Saraha is gracing Deadwood with her music on March 6, 2015. See Flier. 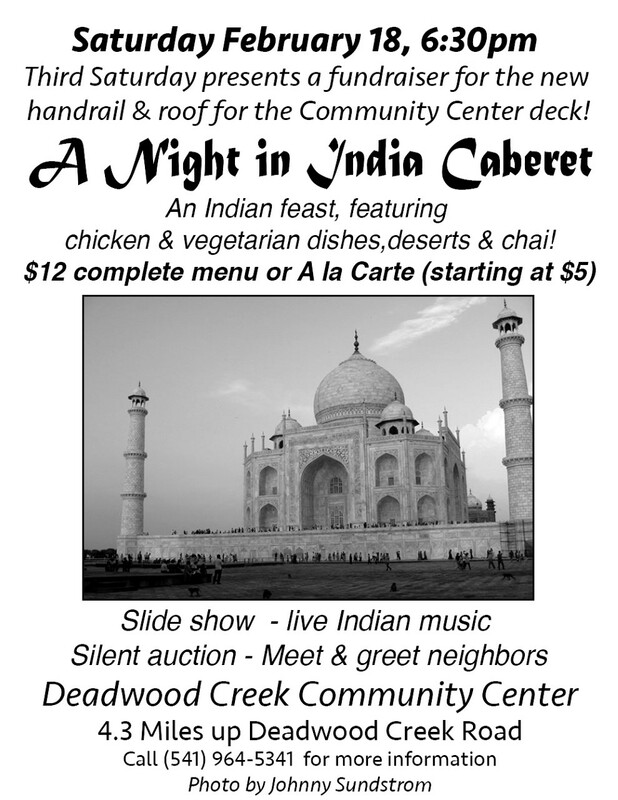 02/21/2015 Third Saturday is February 21st with Indian Cuisine and Live Music Unplugged. 01/13/2015 Third Saturday is January 17th with the Never Ever Band. 12/8/2014 Third Saturday featuring Steel Wool December 20th. 12/7/2014 We had a great turnout for the Annual Holiday Bazaar. This year there was a tremendous showing of artists and some great activity. I found some wonderful gifts for my Christmas list. Thank you for everyone that attended. See Pictures Here. 12/3/2014 Holiday Bazaar Sunday December 7th, 12:00-4:00 p.m. See more information here. 11/10/2014 Third Saturday is November 15, 2014 featuring the "Heavy Chevy" band. See the Music in Deadwood page for more information..
10/02/2014 Third Saturday - The Kush Band. See the music page for more information about the Kush Band. 06/01/2014 Third Saturday - The Heavy Chevy Band. 05/14/2014 Third Saturday event. Michael Anderson Trio. See Music in Deadwood. 04/07/2014 Third Saturday is April 19th featuring Clown Dancer. See Music in Deadwood page. 03/03/2014 Third Saturday is March 15th featuring Kokobola. 02/10/2014 Third Saturday is February 15th featuring The Kush Band. 01/06/2014 Third Saturday is January 18th featuring the Joanne Broh and her Good Rockin' Daddies. 12/02/2013 Third Saturday is December 21st. This month's band is Steel Wool. 12/01/2013 Holiday Bazaar Today, December 1st. Come visit friends and family and buy something great for Christmas. 11/12/13 Third Saturday 11/16/2013 - Never Ever Band. 11/7/2013 This is a reminder to come out and meet with your neighbors on Sunday, November 10 at the Community Center to check on the status of the Community Center building and the various parts and pieces of this great place we call Deadwood. Bring your interests, come see and hear what's going on in and around here, check out the progress and bring your ideas, suggestions, and dreams you may have for our community's needs. Potluck begins at 5:30, meeting begins at 6:30. This is a once a year event that appreciates your support. The 2014 Deadwood Birthday Calendar will have it's debut and will be available at the meeting. The theme this year is "Deadwood Critters" dedicated to Boyd Upchurch and his love for his animals. 10/24/2013 The memorial for Jim Estes will be this Saturday, October 26, at 2 p.m., at the Deadwood Community Center, followed by a potluck reception. Alpha is providing main dishes, salad and drinks. Side dishes and desserts are welcome, or whatever would remind you of Jim. 10/02/2013 Free Domestic Violence Presentation on 10/17/2013. See Flier here. 10/01/2013 Third Saturday with Sol Seed 10/19/13. 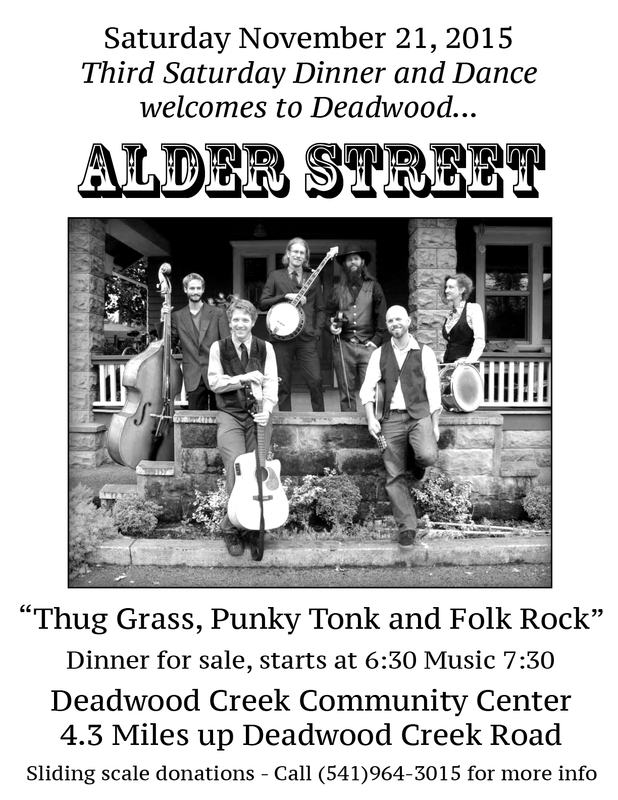 See Flier here or go to Music in Deadwood. 09/13/2013 Third Saturday returns for the Fall, Saturday 21, 2013. See Flier here. Access the "Music in Deadwood" link for more Deadwood Music news. 07/04/2013 The Deadwood Community Center presents: A summer evening dance and party with Bon Ton Roulet from Portland on July 20th. See more info here. 05/27/2013 June 15th is Third Saturday. Enjoy the Joanne Broh Band at the Community Center. 05/03/2013 May Day Fun Run Sunday May 5th. There will be a pancake breakfast and plant exchange after the run. This is a family event. Everyone in Deadwood is welcome. May 18th is Third Saturday this month. The Michael Anderson Trio will be performing. More info on the Music in Deadwood page. Third Saturday is April 20th. 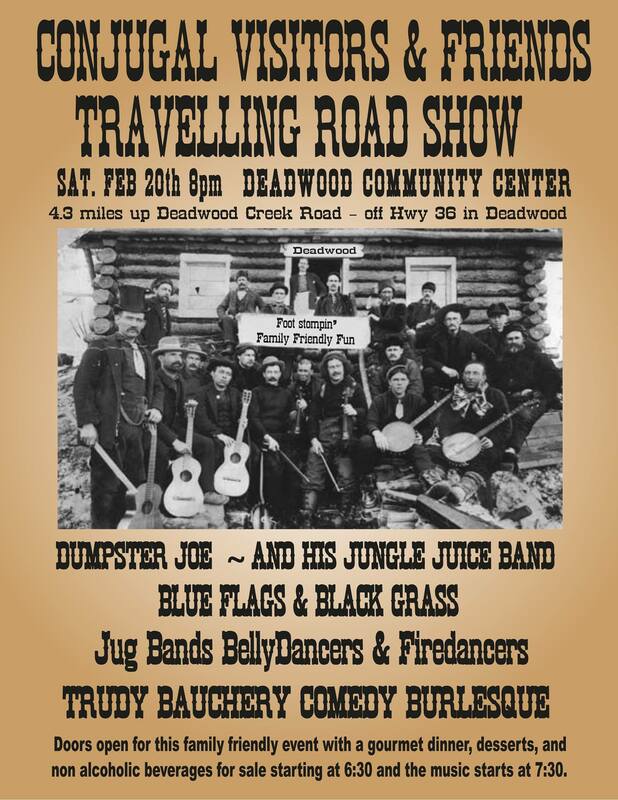 Deadwood Creek Community Center presents: Third Saturday with Skip Jones and company. 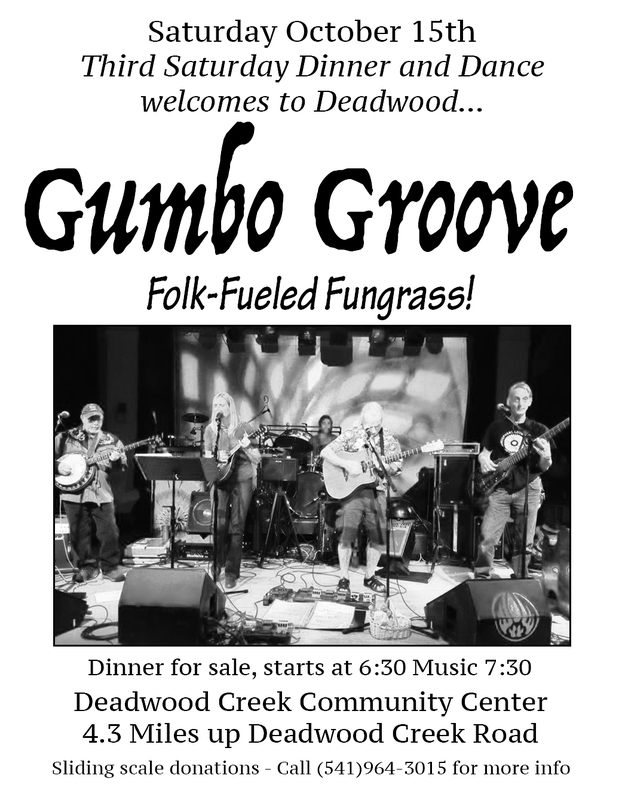 Dinner starts at 6:30 p.m. & music starts at 7:30 p.m. For more info visit the Music in Deadwood page. 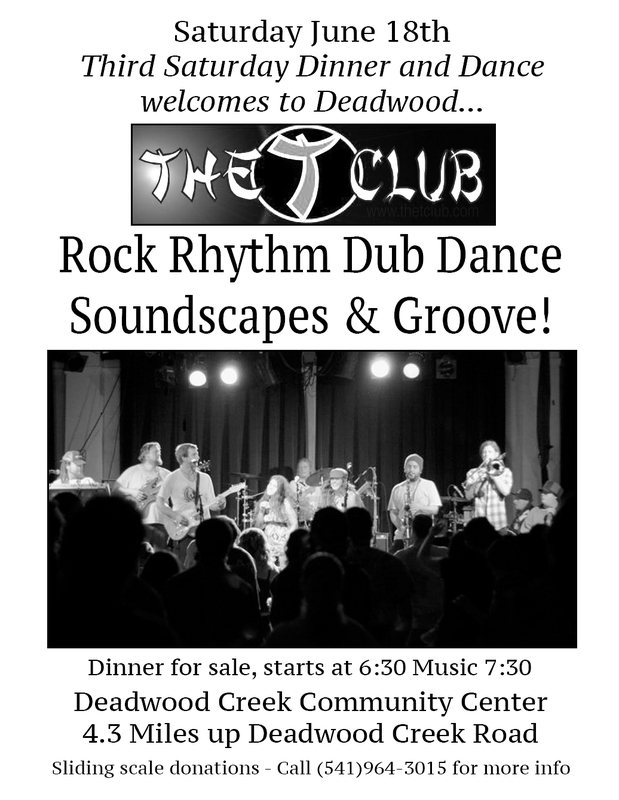 Deadwood Creek Community Center presents: The 'T' Club on February 16th. 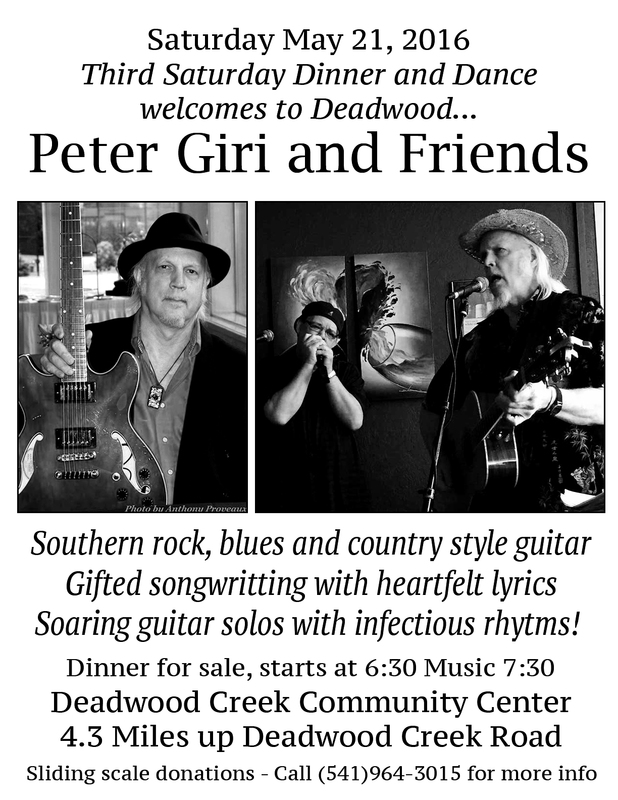 ​Dinner starts at 6:30 p.m. & music starts at 7:30 p.m. For more info visit the Music in Deadwood page. 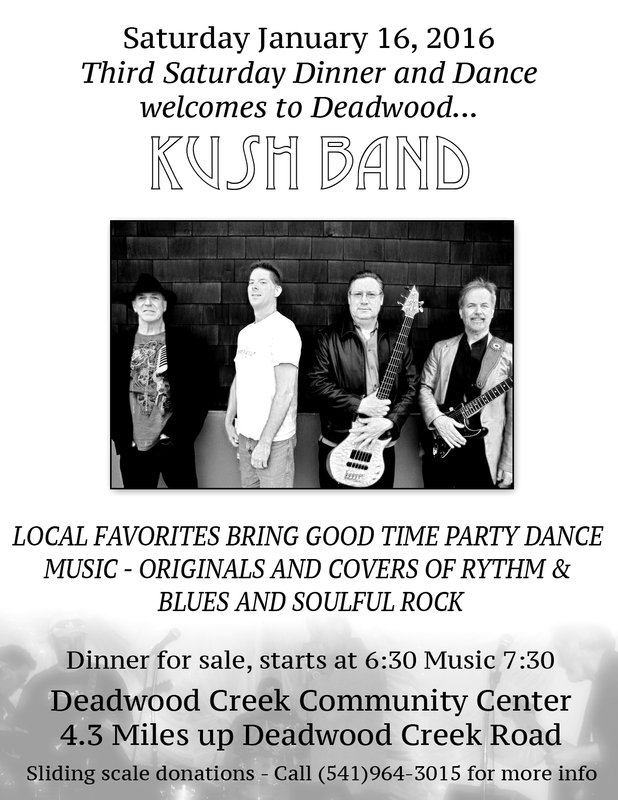 See the Kush Band flier and music sample on the Music in Deadwood page. 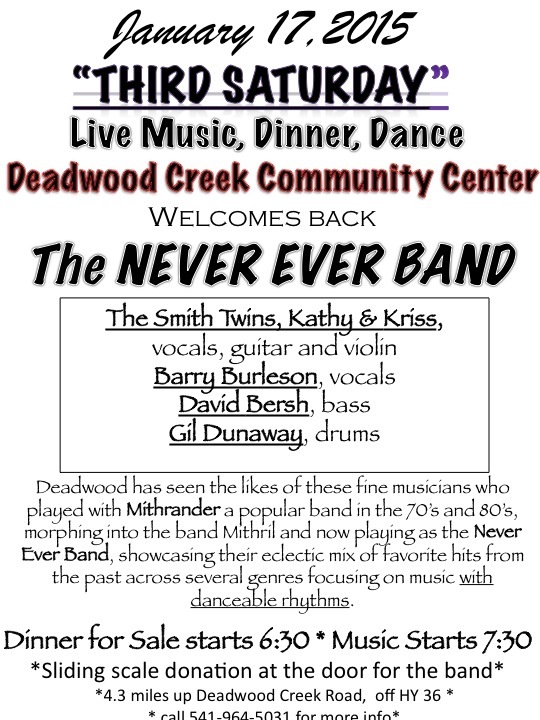 The Deadwood Creek Community Center opens its 2013 "Third Saturday" Live Music, Dinner, and Dance series on Saturday, January 19 welcoming back the fabulous and historic KUSH Band. The KUSH Band is a rock and blues group of musicians well known to Florence and surrounding areas. Several members have been playing together since the late seventies. Known for a variety of good dance and party music they are always a strong draw at the "Chowder Blues and Brews" festival in Florence in the fall, and can always be found on Bay St. during Rhody Fest. For over three decades they have been known to come to the aid of any number of benefits for individuals and organizations, Frank Welles, harmonica and lead vocalist, came out from Pensacola, Florida, in the mid seventies and hooked up with Florence native Marc Barnum, on bass and vocals. Soon after they met Sunny Sundstrom, guitar and vocals, and were in and out of several bands at that time. The KUSH Band re-organized in the mid-nineties and in the early part of the next decade Rick Buchendal joined as the drummer. In the last few years Bob Rannow, guitar and vocals, has filled out the sound. The band also gets some other good friends involved now and then. The group brings originals and covers, vocal harmonies, and share lead solos all around. They have a lot of fun and you will, too. The Deadwood Creek Community Center is located 4.3 miles up Deadwood Creek Road, off HWY 36. The Center's floating wooden dance floor and the ambiance of this country setting and the warmth of wood fire heater and the friends and neighbors who attend make this local venue a delight for all...and... All ages are welcome to this event where the gourmet dinner and desserts will be for sale starting at 6:30 and the music starts at 7:30. A sliding scale donation is appreciated at the door for the band. Call 541-964-5031 for more info. an Oregon Coast based trio of musicians an Kevin Wolpoff (lead guitar/vocals), Jeremy Anderson (bass/keyboards/vocals),and Vince Hendricks-Davis (drums). 60's psychedelia, 70's funk, reggae, jazz and soul. Come visit us in the quaint community of Deadwood and find some holiday treasure. One of a Kind gifts that will always be remembered. December 1, 2012 from 10:00 a.m. until 4:00 p.m.
Blues, soul, and so much more! Formerly the Broh Taylor Band, this band keeps the tradition of Blues with a Pulse alive. Jerry Zybach joins us as our special guest. family friendly atmosphere welcomes all ages to this always special event. Dinner for sale starts at 6:30, music starts at 7:30. A sliding scale donation is appreciated for the band. The Center is 4.3 miles up Deadwood Creek Rd., off Hwy 36. Call 541-964-5031 for more info...Look forward to seeing you there! ​and we welcome all ages for this family friendly evening. For more info call 541-964-5031. Welcome back! 08/23/2012 Post Office update meeting August 28, 2012. 1. What’s with Congress and the Postmaster General? 2. How are local communities fighting back and winning? ​Saturday, June 16, will be the last "Third Saturday" dinner and dance of this season until September. Skip Jones brings his Spirit of New Orleans energy and music with vocals and keyboard accompanied by the ever talented friend and co musician Byron Case on guitar and base. Both Skip and Byron have been the core of an ongoing blues jam for over 10 years in Eugene area and are considered veteran R & B musicians, highly regarded in music circles. Joined by Mr. Wizard veteran Stan Beecraft on drums. These musicians will put on a great show, as they did two years ago in June when they rocked the Center closing out our first "Third Saturday" series in 2010. Please join us for an evening of music and dinner. As always, our gourmet cooks will provide an amazing seasonal meal and desserts for sale starting at 6:30. Music to start at 7:30. All ages welcome to this family friendly event, sliding scale donation at the door. 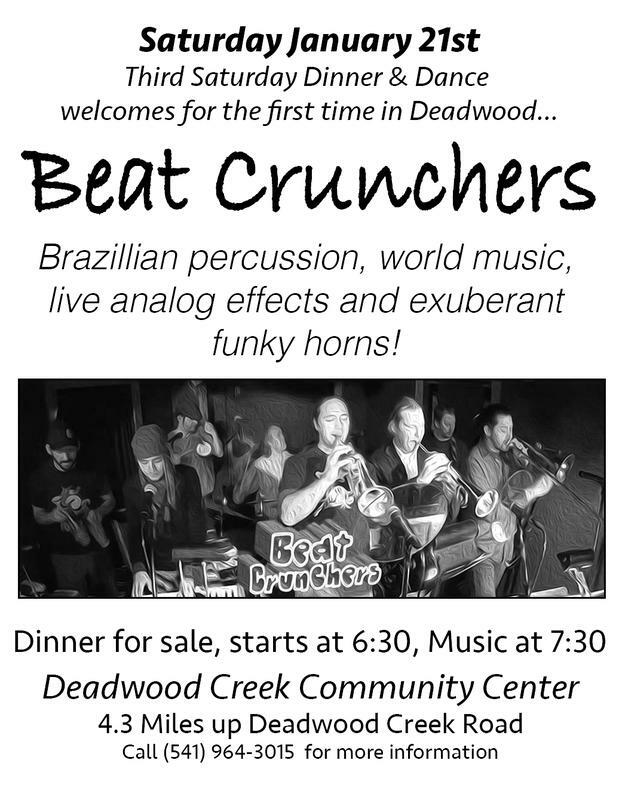 So, come to this beautiful setting at the Deadwood Creek Community Center, visit neighbors, meet new people, dance on our floating wood dance floor, and help us close out our successful series with these talented music makers. 4.3 miles up Deadwood Creek Rd. off HWY 36 in Deadwood. Call 541-964-5031 for more info. danceable live set make Sol Seed a memorable and enjoyable experience for all audiences. These guys love Deadwood and wanted to play ASAP. Come on out and celebrate Cinco De Mayo bluegrass style-these folks are fresh from a Hawaiian trip so who knows what new sounds they'll bring. The Community Center Clean-up went really well. We had a good turnout and everyone found a project for themselves. A lot got done and the grounds look really nice. We followed it up with some great grilled stuff and potluck dishes. Thanks to everyone that attended. The Third Saturday event was wonderful. Great food, music, and dancing. Fun was had by all. On April 21, the Deadwood Creek Community Center’s “Third Saturday” Live Music, Dinner, Dance Series will welcome The Broh Taylor Blues Band who return to Deadwood a year after their energetic, upbeat performance in April of 2011. The band was honored by the Rainy Day Blues Society in 2009 as winner of the Best New Blues Act, and Joanne Broh was celebrated as winner of best Female Blues Vocalist in 2009 and 2010. Cascade Blues Society chose them in 2011 as finalists in “Journey to Memphis . The Broh-Taylor Blues Band is a rockin' 5 piece blues band that combines elements of rock, Texas and Chicago blues, as well as funk into their shows. The high energy band members include Joanne Broh –vocals, Terry Dean Taylor-guitar and vocals, Jim Badalich-bass and vocals, Dan.E.Miller-drums and vocals, and EdGunther-sax. Together they deliver the goods to every show they play and have left people dancing and wanting more. They have opened shows for Leon Russell, Ty Curtis, Karen Lovely, Studebaker John and the Hawks, The Strangetones, and Sonny Rhodes and have played on the Eugene Celebration Broadway Stage in 2009 and 2010, the Willamette Valley Blues and Brews stage with broadcast over the internet and radio by KRVM, and the Waterfront Blues Festival in Portland, OR. Deadwood is pleased to welcome The Broh Taylor Band back for this “Third Saturday” Dinner Dance event, where all ages are welcome. There is a sliding scale donation at the door and the dinner and desserts for sale start at 6:30. Music begins at 7:30. 4.3 miles up Deadwood Creek Rd., off Hwy. 36. 1 1/4 hours from Eugene, 40 minutes from Florence. Call 541-964-5031 for more info. March 17th marks the date for the Saint Patrick's Day event. will rock the house (or in this case the community center). Dinner starts and 6:30 and music starts at 7:30. Feel free to download and print the flier and pass it along to your friends. On Saturday, February 18 The Deadwood Community Center's monthly Third Saturday Live music, Dinner and Dance is sponsoring a combination Mardi Gras, Valentine, Birthday party celebration. Michael Anderson and Friends will be playing a variety of music including R&B, Funk, and Rock with great danceable energy. Michael, a versatile guitarist and singer from Coos Bay will be accompanied by drummer Nate Caplan of Florence, bassist Mike Bachmann of Cottage Grove, and singer Anya Lecurer of Deadwood. Dinner for sale starts at 6:30 with New Orleans style food including vegetarian and meat gumbos, salads, and a special array of deserts to grace the Center's food table. Music starts at 7:30 and costumes are encouraged! Kids Mardi Gras parade at 8pm. Community Center is 4.3 miles up Deadwood Creek Rd., sliding scale donation at the door. All ages welcome. Call 541-964-5031 for more info. 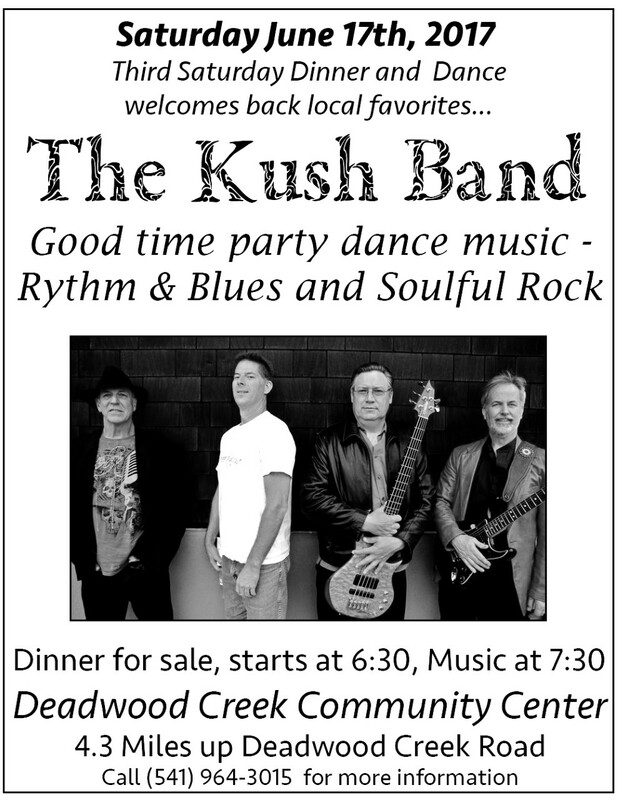 The Kush Band returns to the Deadwood Creek Community Center on January 21 for the "Third Saturday" live music, dinner, dance series. KUSH is appearing for the benefit of fellow Florence musician Jim Ramirez who is undergoing some serious health issues. The public is invited to come enjoy the music of these stellar musicians with dinner for sale starting at 6:30 and the music starts at 7:30. A sliding scale donation is appreciated at the door. KUSH is a well known local favorite band of the Chowder Blues and Brews! They play good time party dance music with originals and covers of rhythm and blues and soulful rock and always rock the house. This is a family friendly event, all are welcome for this special benefit evening. The food is always delicious and affordable, the wooden dance floor "floats" on 750 sleeper pads, and the country setting is friendly and inviting. Deadwood Creek Community Center is 4.3 miles up Deadwood Creek Rd., off HWY 36. Call 541-964-5031 for more info. This will be the KUSH Band's third show in the "Third Saturday" series and we welcome them back. The Annual Deadwood Community Center Meeting was a huge success. The meeting agenda was long but very informative. The board and community members were very engaged. In addition to updates on the Community Center maintenance, repairs and current financial situation, the agenda included the status on the Post Office, Fire Department, Deadwood Ditto, the Annual Deadwood Community Calendar, Care, Watershed, Neighborhood Watch, Mapleton School, Local and International Affairs that effect Deadwood. Special Thanks to all grounds keepers, maintenance crew, and Mary Lou and other artists that designed, built, and installed the new sign for the community center.